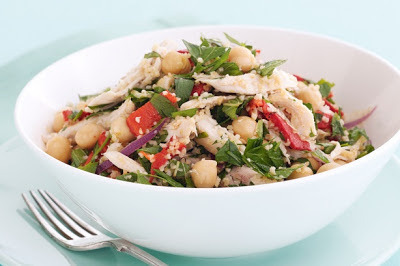 The Lebanese Recipes Kitchen (The home of delicious Lebanese Recipes and Middle Eastern food recipes) invites you to try Chicken tabouli salad recipe. Enjoy the Middle Eastern Cuisine and learn how to make Chicken tabouli salad. This traditional tabouli salad contains chicken to elevate it from side dish status to star performer. Place burghul in a heatproof bowl and pour over boiling water. Stir to combine. Stand, uncovered, for 10 minutes. Drain well, pressing to remove as much liquid as possible. Transfer burghul to a large bowl. Add chicken, capsicum, onion, chickpeas, parsley, mint, oil and 1/3 cup lemon juice to burghul. Season with salt and pepper. Toss to combine. Spoon salad into bowls and serve.